Ever wondered what R6 million looks like? The Tertiary School in Business Administration’s (TSiBA) 2014 Scholarship & Awards Ceremony is the place to find out. 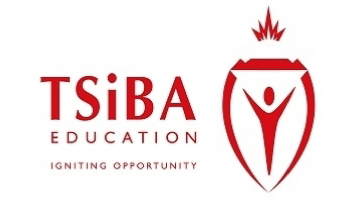 On Wednesday 19 February 2014 one hundred and twenty TSiBA Cape Town students were awarded full tuition scholarships to study towards their Higher Certificate in Business Administration (HCBA). These students earned their place at TSiBA by not only meeting admission criteria and passing academic tests, but by also successfully completing an intensive orientation week selection process. Each tuition scholarship has a rand value of R48 800 per annum which includes things like administration fees, textbooks, stationery, one meal per day, tutorials, mentorships, IT facilities and online teaching tools, printing allowance, student counseling (personal and career), course materials and workbooks, experiential learning programmes as well as internships and placements. Taking into account TSiBA has already had five Mandela Rhodes Scholars, two Kofi Annan Scholarship winners currently enrolled in Masters’ postgraduate study in Geneva and Berlin, as well as two final year degree students in the prestigious Allan Gray Orbis Foundation Fellowship a R6 million invested in these students is a solid one. Since founded in 2004 TSiBA has already provided scholarships to around 1 200 talented young people, who may otherwise not have been able to access higher education due to financial or educational constraints. The philosophy of Paying it Forward is an important part of TSiBA’s culture. Students who are awarded scholarships are not required to pay for their education monetarily, but rather to Pay it Forward by transferring the knowledge, skills and resources that they gain at TSiBA to their communities. In this way, TSiBA’s vision of Igniting Opportunity is realized. “TSiBA was founded as a not-for-profit higher education institution ten years ago with the mission to graduate entrepreneurial leaders who ignite opportunity and social change which is why we select people who want to make a difference in their communities. TSiBA degree graduates leave with a fully accredited business degree, 95% chance of finding a job and the skill-set that enables them to successfully undertake advanced tertiary education.” says Adri Marais CEO and TSiBA co-founder. The event was MC’ed by Cindy van Wyk and Muneebah and Natheerah Titus – affectionately known on campus as the ‘TSiBA Triplets’. They are all first year Bachelor in Business Administration (BBA1) students, having completed their undergraduate foundation year HCBA in 2013. The new students were inspired to work even harder with the announcement of the 2013 second semester academic achievers, as well as the ten students who were awarded sponsored Lewis Group Foundation scholarships. These scholarships provide a contribution towards subsistence costs – which is a life-saver for many students from disadvantaged communities. The professionalism and maturity of these young adults exemplifies how TSiBA grooms exceptional, inspirational leaders and, just as importantly, well-rounded individuals. TSiBA’s unique academic approach is referred to as the Profile of Graduateness which layers attitude and personal development around a student’s academic skills. 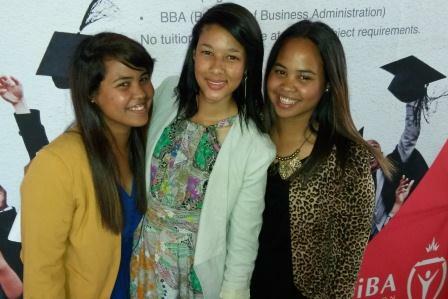 Photo: Muneebah Titus, Cindy van Wyk & Natheerah Titus, all BBA1 students & MC for the event.